You can provide a URL that can be used in external web applications (e.g. portals) to link to a specific Jedox report. Options for this feature are available in the report properties. In Reports, right-click on a report name and click on Properties. The Properties dialog has two tabs, General and Link. Click on Link. Mode: here you can specify whether the URL will display the report within the whole project (i.e., with the navigation panel on the left side) or in standalone mode without the navigation panel. Interface: these options control which parts of the report UI should be shown. Furthermore you can enable sheet zooming for mobile devices and sheet scrolling. Unchecking all options will render the report without any extra UI elements, allowing seamless integration into external web pages. If a specific user has defined use of the ribbon menu instead of the toolbar, the ribbon will only be hidden in standalone links if the “Show menubar” option is not checked. If the menu bar and the toolbar are not shown, you can provide logout functionality in your application by defining a macro with the __logout() function and attaching it to an object, such as a button. 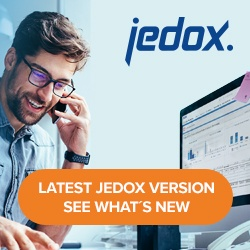 When using a report hyperlink in an external application, you can extend the hyperlink with settings for variables in the Jedox report, allowing you to pass information (e.g. “point of view” settings) from the external environment to the report. It is possible to set values for multiple variables as well. Each further variable is simply appended with similar syntax.